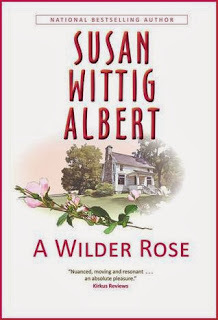 A Wilder Rose by Susan Wittig Albert is available at Amazon and Barnes and Noble. In 1928, Rose Wilder Lane—world traveler, journalist, much-published magazine writer—returned from an Albanian sojourn to her parents’ Ozark farm. Almanzo Wilder was 71, Laura 61, and Rose felt obligated to stay and help. To make life easier, she built them a new home, while she and Helen Boylston transformed the farmhouse into a rural writing retreat and filled it with visiting New Yorkers. Rose sold magazine stories to pay the bills for both households, and despite the subterranean tension between mother and daughter, life seemed good. Then came the Crash. Rose’s money vanished, the magazine market dried up, and the Depression darkened the nation. That’s when Laura wrote her autobiography, “Pioneer Girl,” the story of growing up in the Big Woods of Wisconsin, on the Kansas prairie, and by the shores of Silver Lake. The rest—the eight remarkable books that followed—is literary history. But it isn’t the history we thought we knew. For the surprising truth is that Laura’s stories were publishable only with Rose’s expert rewriting. Based on Rose’s unpublished diaries and Laura’s letters, A Wilder Rose tells the true story of the decade-long, intensive, and often troubled collaboration that produced the Little House books—the collaboration that Rose and Laura deliberately hid from their agent, editors, reviewers, and readers. Why did the two women conceal their writing partnership? What made them commit what amounts to one of the longest-running deceptions in American literature? And what happened in those years to change Rose from a left-leaning liberal to a passionate Libertarian? In this impeccably researched novel and with a deep insight into the book-writing business gained from her own experience as an author and coauthor, Susan Wittig Albert follows the clues that take us straight to the heart of this fascinating literary mystery. A fictional (semi)biography of Rose Wilder Lane, the daughter of Laura Ingalls Wilder. The most fascinating part of this story was seeing Laura Ingalls Wilder portrayed in a different light than was cast by the Little House series - for a brief moment, I found myself not liking her and then, I realized she was human. I read the Little House books when I was a kid; I loved the history they offered but my research into the real historical figures was limited. As I got older, I heard about the possible co-authorship between the mother-daughter duo but knew little else. I was reminded when I read the blurb for this book on NetGalley and requested a free copy for review. The story focuses solely on the co-authorship of the Little House books, with us readers seeing little else of Rose's life besides a summary revolving around Rose's bibliography (I may seek out a couple of Lane's titles to peruse at a later date, but I'm not in a rush to do so). In the end, this feels like a day-dream attempt to justify why Rose might have ghostwritten her mother's work. Many characters remained distant and in the background - like the father, Almanzo, which is a shame, given his involvement in Farmer Boy. I wish Rose's life had been fleshed out, with readers seeing her as both a child and an elderly person. We never see any character growth in Rose, which may account for story losing steam as it progresses, with already-distant characters treated like footnotes at the end. I used to daydream about being a pioneer girl as a child and it was that quality of this book that redeemed it. I wish the summaries had been expanded to match the real-action scenes in the book, never mind if they'd be part-fantasy (that only encourages me to return to my own childhood imaginings and reinvent them).